New to no-till? Gather more about the basic principals of no-till systems, and how to overcome the initial challenges to successfully convert to the practice. You'll find stories of successful no-tillers and their operations. Read how they overcame their challenges. The "My No-Till Journey" blog is where farmers who are newer to no-till practices share how they tackle challenges and push to succeed. 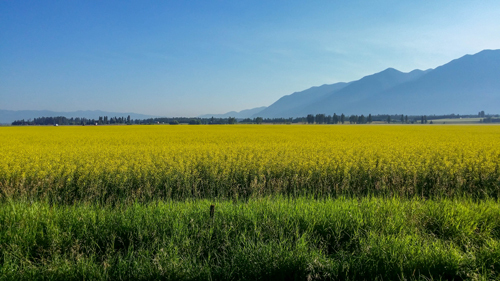 Throughout the next year, Kalispell, Mont., grower Doug Manning shares his journey to implementing no-till on his farm, where he raises wheat, barley, peas and canola. Feel free to leave comments, or tips about succeeding with no-till, at the conclusion of each post. Doug Manning will begin sharing his journey as he adopts no-till practices on his Montana farm — in an area that sees little or no reduced tillage. Manning no-tills wheat, barley, peas and canola and looked overseas to buy a drill that works for him. Even though members of the community recognize the need for greater efficiencies and improved soil health, many are unwilling to take the risks to adopt the new practices. Until multiple years of obvious positive results (i.e. higher yields, drought resistance, lower input costs) are apparent, many will be unwilling to change. But on my farm, the journey to implementing no-till practices continues, and I look forward to sharing my story with you. In this three-part video series, associate editor Laura Allen interviews No-Till Farmer founder and editor Frank Lessiter about no-till, the key moments that have impacted its movement, his achievements in promoting the practice, and what he sees happening with the future of no-till. Terry Taylor, Illinois no-tiller, shares tips for those incorporating cover crops into their rotation for the first time. The Salt Index — What is it, and is it Important? The term ‘salt index’ has been used for a variety of things — some that make sense, and some that were perhaps not technically accurate. Here’s what you need to know about the term. In search of higher yields, many producers aim to plant soybeans early in the season. When considering this practice, there are two diseases to be mindful of: Sudden death syndrome (SDS) and Pythium root rot (PRR). On livestock farms with significant manure production, long term surface application of manure has resulted in a concentration of phosphorus in the top inch or two of soils, which can dissolve into surface water and leave the fields in clear run off. According to Penn State Extension, injection may be the answer for using liquid manure in no-till fields. Temperature inversions are common during the growing season, and knowing how to tell if one is likely to occur may help prevent Dicamba damage on susceptible plants and crops, say researchers at the University of Missouri. Find out what their research reveals about how wind speed, cloud cover, obstructions and other factors affect temperature inversions. Data from the Census of Agriculture 2017 show a stable-but-growing number of farms no-tilling, big growth in reduced tillage, along with 15 million acres of cover crops seeded — up 49% since 2012. The next deadline for Conservation Stewardship Program (CSP) applications to be considered for funding in fiscal year 2019 is May 10, 2019. The NRCS plans to invest up to $700 million for new enrollments and contract extensions in fiscal year 2019. In the Midwest Corn Belt, corn often covers 40 percent of the landscape or more. In partnership with the Honey Bee Health Coalition, the National Corn Growers Association identifies potential effects of agricultural practices on bees at each stage of production and recommends ways to mitigate those impacts. A thin wheat stand in spring does not always correspond to lower grain yield. Rather than relying on a visual stand assessment, growers can use these tools to estimate the yield potential of their winter wheat crop before deciding whether a field should be destroyed. In case you missed them, here are the items that have garnered the most interest from farmers in the month of March. How Do You Say No-Till? Click through the signs to learn how to say no-till in different languages. As part of the 25th anniversary of the National No-Tillage Conference, the staff of No-Till Farmer honored 25 active individuals who have made no-till work and grow over the years. The 25 Living Legends are listed in alphabetical order. With 270 acres of irrigated, double-cropped land, as well as 375 acres of hilly, dryland farm ground, converting to no-till wasn’t always an easy transition for Michael Crowell. In this presentation, the Turlock, Calif., no-tiller talks about the steps he took to reclaim abused soils that were worked wet continuously and how he made irrigated land respond positively to no-till. Crowell also discusses what he did to improve the calcium-to-magnesium ratios for better soil structure, what’s worked — and what hasn’t — in regards to fertility and things to be careful of when converting planters to no-till so that you achieve the right setup. In his 40 years of farming, Mike Wolpert has no-tilled for more than 20 of them. In this presentation, he discusses what’s worked and what hasn’t over the past two decades. The West Virginia no-tiller also shares his 7-step plan for keeping your no-till operation thriving for another 20 years: how to establish your farm’s mission; adjust your attitude for success; become goal-oriented; create action plans for long- and short-term goals; assess your results; and adapt your plans for future improvement. In an industry driven by marginal cost of production, how do you build a competitive advantage that will allow your operation to earn an economic profit consistently? How do no-till, cover crops and active soil biology combine to enhance long-term results? After recently completing an Eisenhower Fellowship in Australia and New Zealand, no-tiller Dan DeSutter of Attica, Ind., shares his adventures in soil health and discuss the relationship between regenerative agriculture and building a profitable business. With more than 3 decades experience with continuous no-till, Roger Harrington knows some of the challenges farmers face in making this system work. The Ollie, Iowa, no-tiller raises 1,300 acres of corn, soybeans and alfalfa on rolling ground in southeast Iowa, and will share what he’s done with drainage and soil management to limit erosion and protect highly productive farmland. For 30 years, Marion Calmer has studied the impact on yields of no-tilling corn in ultra-narrow rows. The Alpha, Ill., no-tiller became so convinced at the benefits that he designed his own corn head to harvest 15-inch rows.